THUR 27 SEPT - Brisbane THE HIFI - second show onsale now!!! FRI 28 SEPT - Brisbane THE HIFI - SOLD OUT!! SAT 29 SEPT - Sydney THE HIFI - SOLD OUT!! MON 1 OCT - Sydney THE HIFI - onsale now! SAT 6 OCT - Adelaide THE GOV - selling fast!!! SUN 7 OCT - Perth THE ASTOR - selling fast!!! THUR 11 OCT - Melbourne THE HIFI - second show onsale now!!! FRI 12 OCT - Melbourne THE HIFI - SOLD OUT!! SAT 13 OCT - Hobart BRISBANE HOTEL - selling fast!!! In an era beset by an abcess of competition, an influenza of celebrity, a continental flux of technology... and the gasping breath of Regurgitator's nineteenth year as the twilight of its teen years bears down on the double decades. Without looking back for the sake of cutting back... they take a knife to the face of nostalgia and sculpt it a new nose with the highly unexpected - playing TU PLANG and UNIT back to back. The thought has wafted around about this concept for a few smelly years now after outside forces prompted the idea with Quan. Discussed but never decided upon like all things regurgitated... just as it looked like a decision was ripe the Falls Festival off the still sweaty back of Public Enemy playing Fear of a Black Planet proposed that the guys do a similar thing with Unit at the end of 2011. After debating the merits of this a decision kind of made itself to tackle the idea in that format. The response was much better than anticipated and in the process the album found itself lodged in the upper branches of the Triple J Top 100 album thing. The third performance at Southbound in Busselton was particularly good, with Hugh delivering, as one overly excited punter described it, an incredible "feels like my head is trapped inside the stereo" live mix... whatever his craze it left everyone with a positive frame of mind about doing an eventual tour albeit when another decision could be reached that is. So after further speculative discussion... and with Tu Plang twisted in arm the time for a retrotech makeover of these seminal albums is now upon us. Along for the glide will also be Indonesian two-piece phenomenon SENYAWA... having performed at Melbourne Jazz festival, MoNA FoMA and Adelaide Festivals, Rully and Wukir return with their homemade bamboo instrument and perform "their traditional Javanese heritage filtered through a framework of contemporary experimental music practices" as special invited guests of Regurgitator. Continually unaware of guidebooks or the like... its just funtimes traffic as usual. FRI 28 SEPT - Brisbane THE HIFI -  SOLD OUT!! SAT 29 SEPT - Sydney THE HIFI  -  SOLD OUT!! 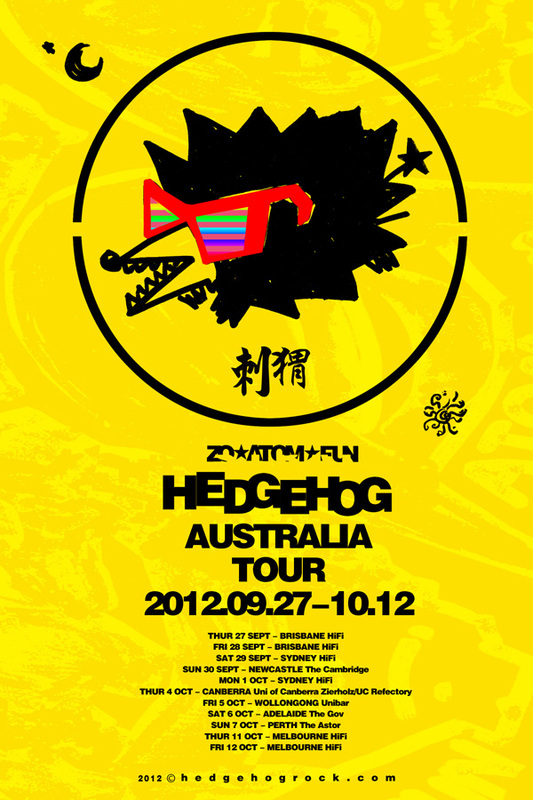 MON 1 OCT - Sydney THE HIFI  -  onsale now! SAT 6 OCT - Adelaide THE GOV  -  selling fast!!! SUN 7 OCT - Perth THE ASTOR  -  selling fast!!! SAT 13 OCT - Hobart BRISBANE HOTEL  -  selling fast!!! SAT 1 SEPT - RED DEER FESTIVAL, Mt Samson, Qld - SOLD OUT!! Senyawa is an experimental music duo made up of Rully Shabara (extended vocal technique) and Wukir Suryadi (homemade instrument). The music that they create is a combination of extended vocal technique and a homemade instrument. The instrument was handcrafted by master instrument builder Wukir out of one long piece of bamboo, it is a string instrument with guitar pick-ups—it is amplified and processed through several effects pedals but at times is played as an acoustic instrument, percussion and string instrument. They are located in the ancient city of Jogjakarta, Central Java, Indonesia and their music is a reflection of their traditional Javanese heritage filtered through a framework of contemporary experimental music practices. Senyawa try to push the boundaries of both traditions in an attempt to mix the musics’ of the east and the west to create a new sound. As a duo they have been performing and playing together extensively for the last 3 years and we have toured Indonesia several times over. Last year they were invited to  perform internationally for the first time at the Melbourne International Jazz Festival sharing the stage with many great musicians such as Faust, Yoshida Tatsuya, Tony Conrad and Charlemagne Palestine. Since then they have performed at MONA FOMA in Tasmania and at the Adelaide Festival with Korean singer Bae Il Dong. Wukir as a solo performer recently finished a residency at STEIM in Amsterdam and Rully Herman was for many years lead singer of legendary experimental Indonesian band ZOO. In the past they have collaborated with many notable musicians such Rod Cooper, Lucas Abela, Yasuke Akai, made a video with film maker Vincent Moon and most recently have recorded an up coming album with Japanese improvising master Uchihashi Kazuhisa. From co-hosting the legendary Mirador show on FM 102.1 4ZZZ to pushing Jamaican music to the Brisbane youth via club circuit, Swedish born, Brisbane based Bo Staffan Stahlman aka Toothy the Swede is a connoisseur of the tiny Caribbean island's sound. Addicted to constant research of yesteryear reggae he will be showcasing a time line of sounds, from the earliest jamaican ska, rocksteady to roots, dub and 80's dancehall in a strictly vinyl fashion. Tim Whitt AKA BottleRockets is an Adelaide based DJ, producer and re-mixer. As a producer, he’s currently making dance music which falls loosely into the categories of Tropical Bass, War House, Dirty Dutch and Moombahton. As a DJ he is best known for his frenetic House Party sets where he mixes an eclectic selection of Hip Hop, Rock, Pop, Booty Beats, Dubstep and Electro. Debuting officially at Big Day Out 2011, BottleRockets has since supported the likes of Regurgitator, The Horrors (UK), Luke Million, Das Racist (USA), The Killgirls and The Levitators and toured to Melbourne, Sydney, Auckland and Wellington as making the finalist list for the RedBull Thre3Style Competition and Adelaide Fringe SPIN DJ 2011.